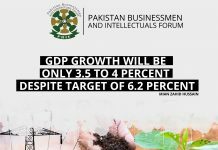 Pakistan is prosporing further with established economy; recommendations of business community will be considered in forthcoming budget. 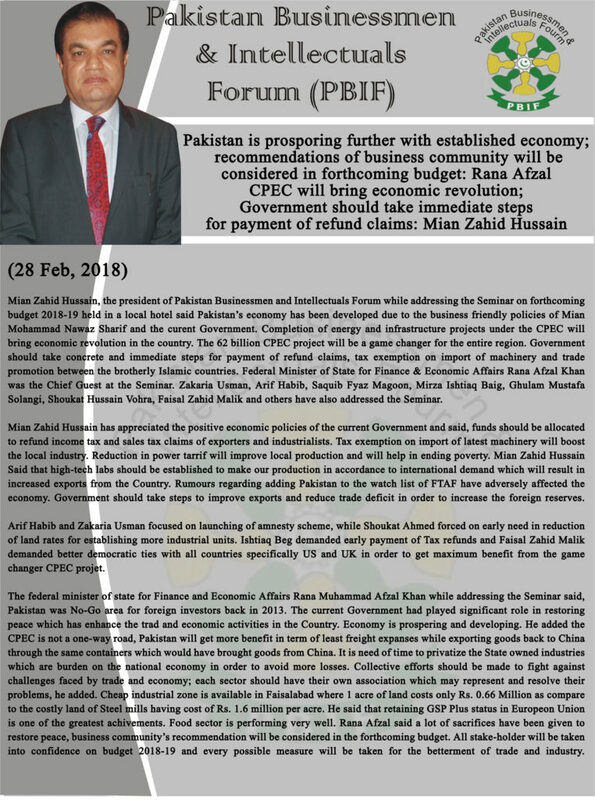 CPEC will bring economic revolution; Government should take immediate steps for payment of refund claims.To boost foreign exchequer, Government needs to work on exports promotion. 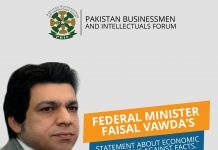 Karachi (P.R) Mian Zahid Hussain, the president of Pakistan Businessmen and Intellectuals Forum while addressing the Seminar on forthcoming budget 2018-19 held in a local hotel said Pakistan’s economy has been developed due to the business friendly policies of Mian Mohammad Nawaz Sharif and the curent Government. Completion of energy and infrastructure projects under the CPEC will bring economic revolution in the country. The 62 billion CPEC project will be a game changer for the entire region. 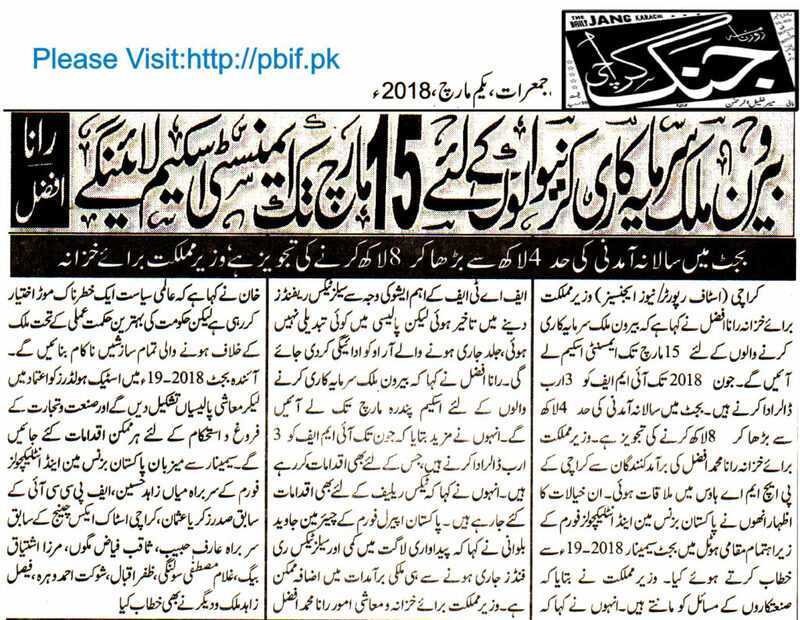 Government should take concrete and immediate steps for payment of refund claims, tax exemption on import of machinery and trade promotion between the brotherly Islamic countries. 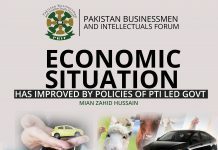 Federal Minister of State for Finance & Economic Affairs Rana Afzal Khan was the Chief Guest at the Seminar. 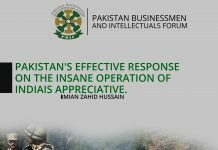 Zakaria Usman, Arif Habib, Saquib Fyaz Magoon, Mirza Ishtiaq Baig, Ghulam Mustafa Solangi, Shoukat Hussain Vohra, Faisal Zahid Malik and others have also addressed the Seminar. 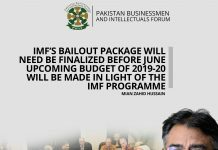 Mian Zahid Hussain has appreciated the positive economic policies of the current Government and said, funds should be allocated to refund income tax and sales tax claims of exporters and industrialists. Tax exemption on import of latest machinery will boost the local industry. Reduction in power tariff will improve local production and will help in ending poverty. 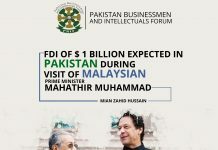 Mian Zahid Hussain Said that high-tech labs should be established to make our production in accordance to international demand which will result in increased exports from the Country. 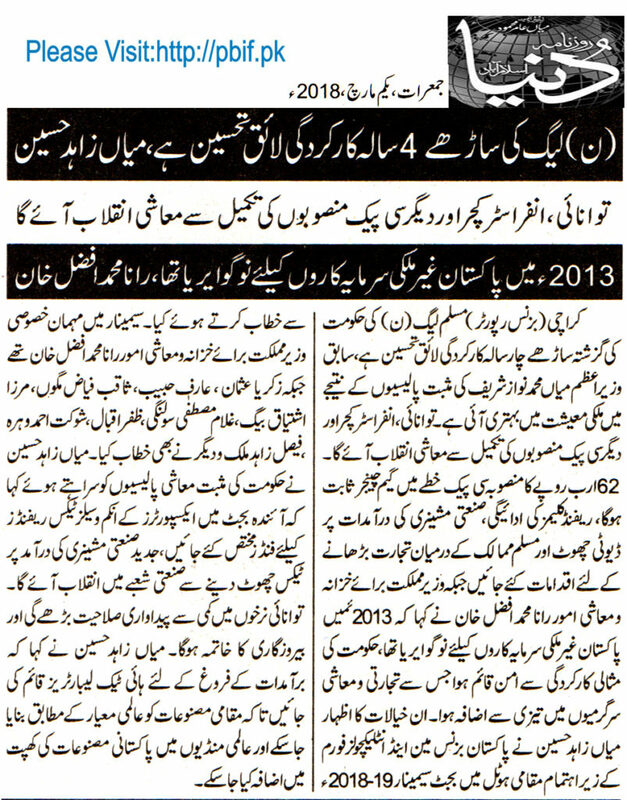 Rumors regarding adding Pakistan to the watch list of FTAF have adversely affected the economy. Government should take steps to improve exports and reduce trade deficit in order to increase the foreign reserves. 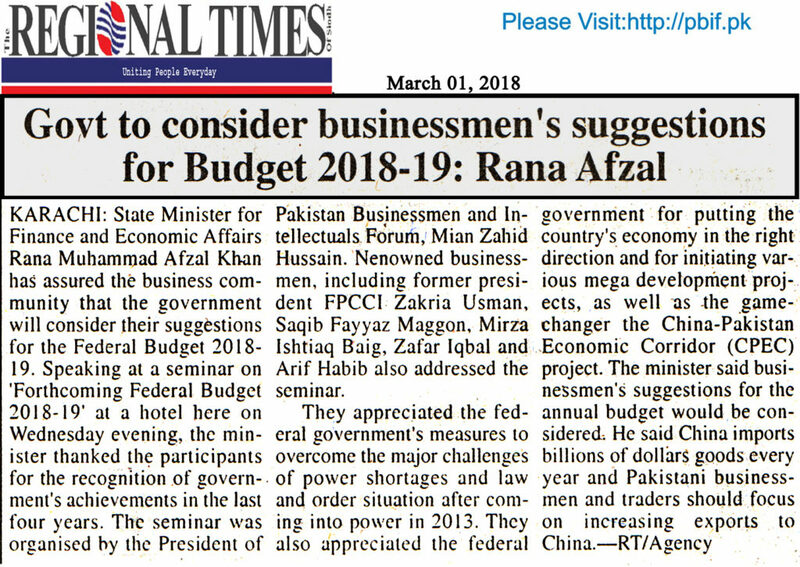 Arif Habib and Zakaria Usman focused on launching of amnesty scheme, while Shoukat Ahmed forced on early need in reduction of land rates for establishing more industrial units. 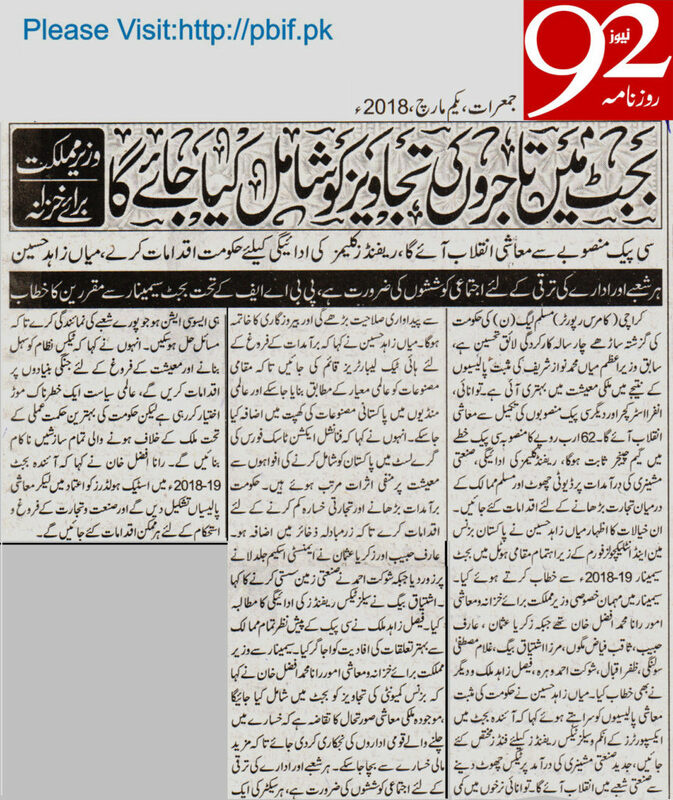 Ishtiaq Beg demanded early payment of Tax refunds and Faisal Zahid Malik demanded better democratic ties with all countries specifically US and UK in order to get maximum benefit from the game changer CPEC projet. 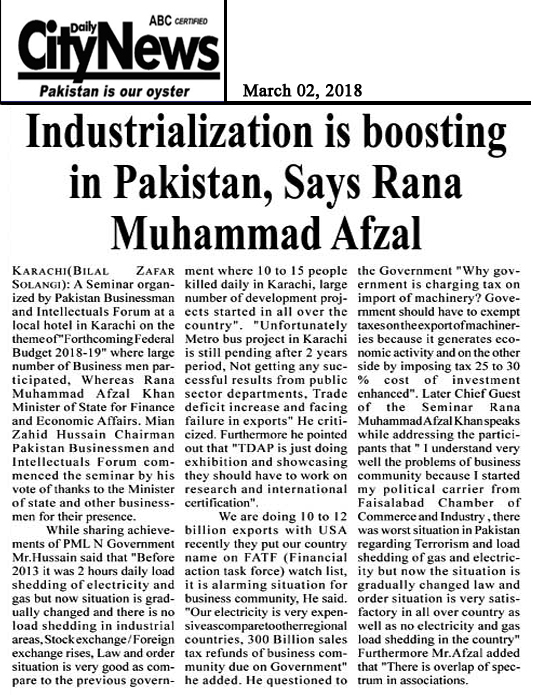 The federal minister of state for Finance and Economic Affairs Rana Muhammad Afzal Khan while addressing the Seminar said, Pakistan was No-Go area for foreign investors back in 2013. The current Government had played significant role in restoring peace which has enhance the trad and economic activities in the Country. 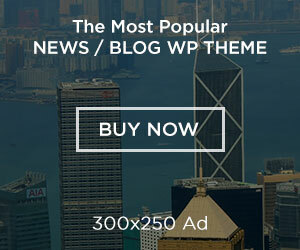 Economy is prospering and developing. He added the CPEC is not a one-way road, Pakistan will get more benefit in term of least freight expanses while exporting goods back to China through the same containers which would have brought goods from China. 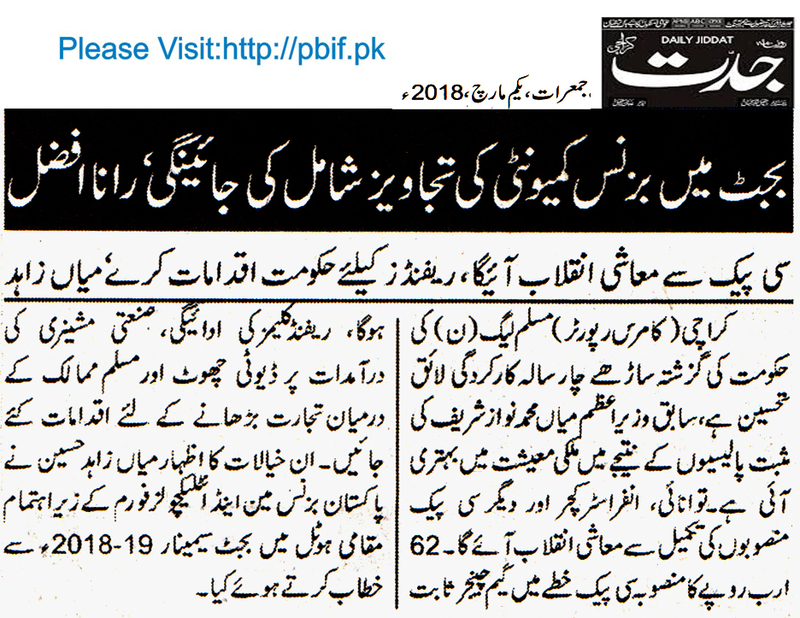 It is need of time to privatize the State owned industries which are burden on the national economy in order to avoid more losses. Collective efforts should be made to fight against challenges faced by trade and economy; each sector should have their own association which may represent and resolve their problems, he added. 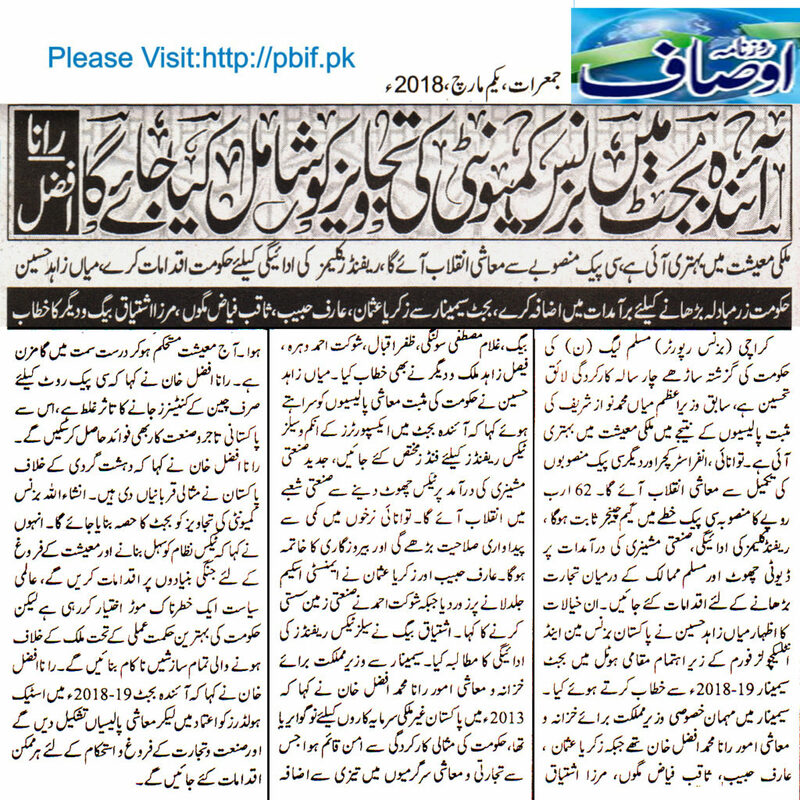 Cheap industrial zone is available in Faisalabad where 1 acre of land costs only Rs. 0.66 Million as compare to the costly land of Steel mills having cost of Rs. 1.6 million per acre. He said that retaining GSP Plus status in European Union is one of the greatest achievements. 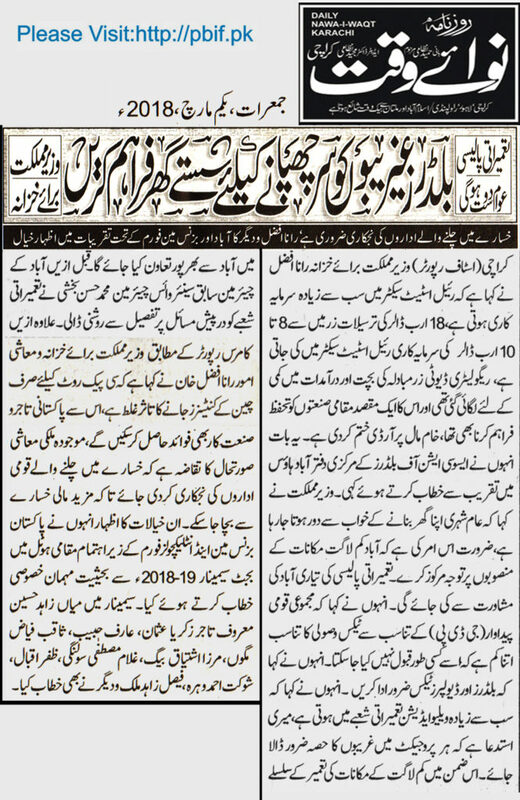 Food sector is performing very well. 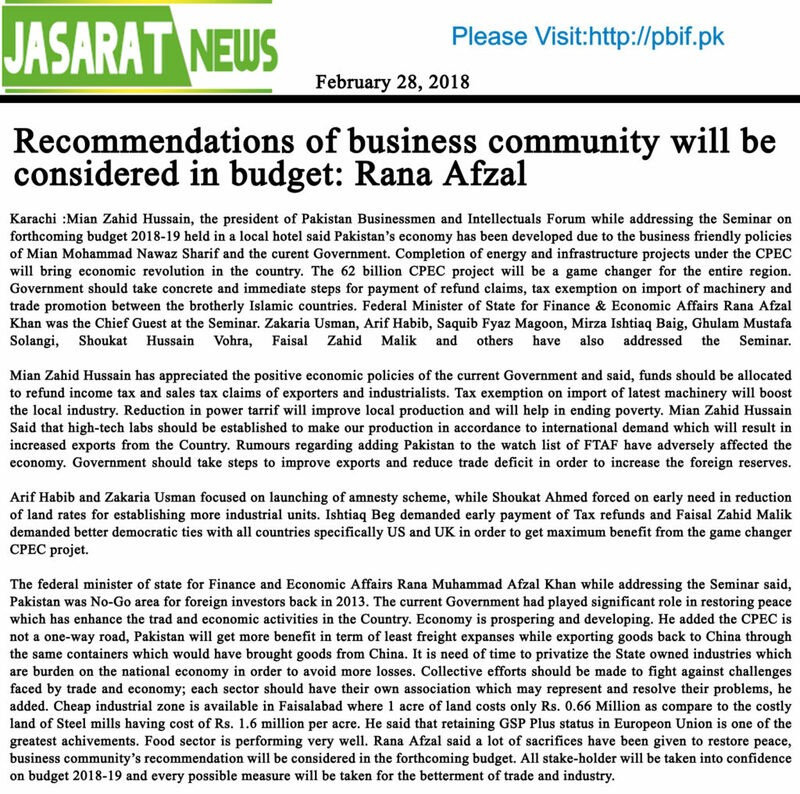 Rana Afzal said a lot of sacrifices have been given to restore peace, business community’s recommendation will be considered in the forthcoming budget. All stake-holder will be taken into confidence on budget 2018-19 and every possible measure will be taken for the betterment of trade and industry. 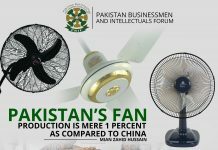 Previous articlePrivatization of suffering units will increase foreign investment in the country resulting in Economy growth. 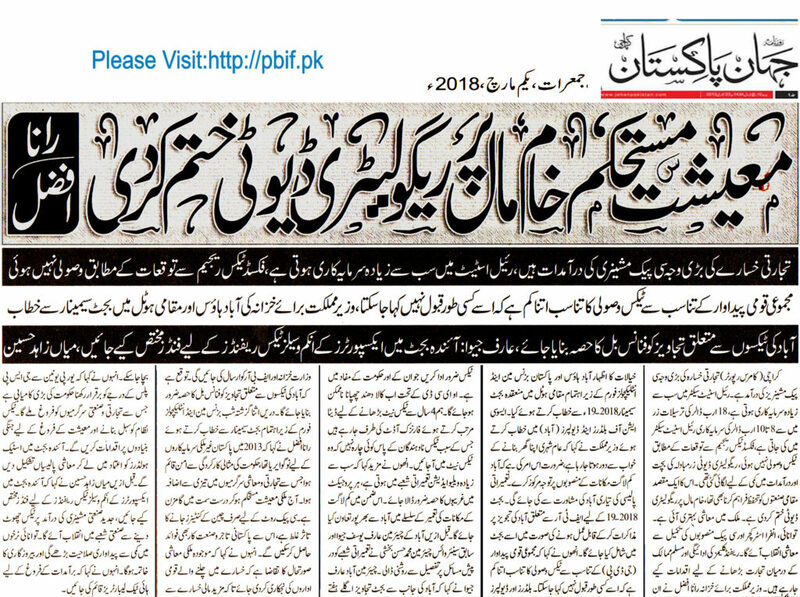 Foreign exchequer, employment, income may be increased through privatization resulting in enhanced living standard. 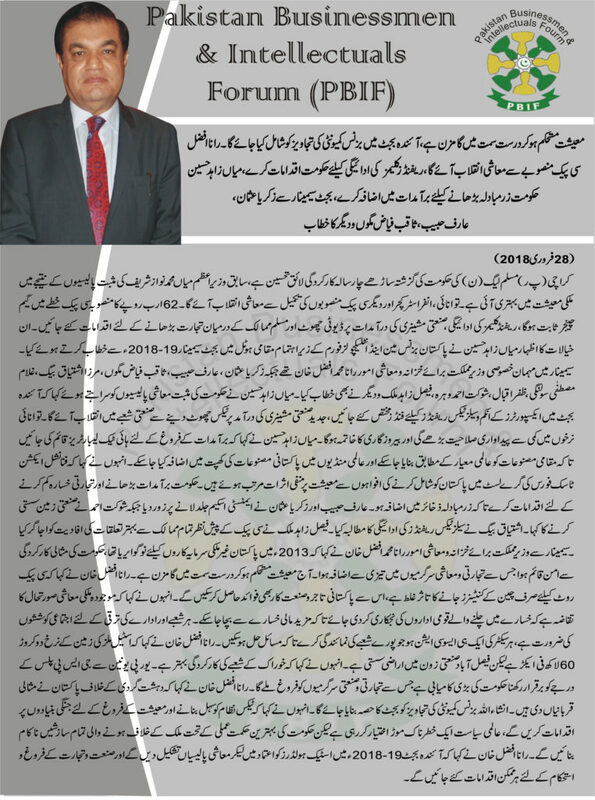 PIA will experience marvellous growth after privatization. 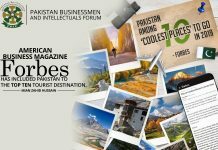 Next articlePakistan has become Investor’s Paradise due to Government’s business friendly Investment Policies. 100 percent export oriented industrial units are allowed to operate anywhere in the country. Refund and Notices issues of Traders and Industrialists should be resolved.